The Summer vacation season got off to a great start this Memorial weekend. Bryson City’s motels and campgrounds were filled, there were great crowds at the Heritage Festival, and Deep Creek had a steady parade of holiday vacationers floating and bouncing along on brightly-colored “tubes” (the old-fashioned black truck-tire inner tubes have all but disappeared). 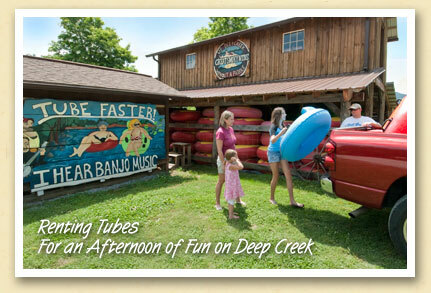 Since the Park Service does not rent tubes, the Hannah family of Hope Mills, NC rented their tubes at the Deep Creek Tube Center and Campground, where they were camping. The Tube Center is just one of several tubing vendors along West Deep Creek Road near the entrance to the Great Smoky Mountains National Park, and on the Oconaluftee River in Cherokee.